Get tired of going to each and individual site to search for information? Why not create your own personal search engine that provides relevant results from the sites that you trust and visit frequently? Try out Rollyo. Rollyo is a free site that allows its users to create a Searchroll or save Searchrolls created by other users. 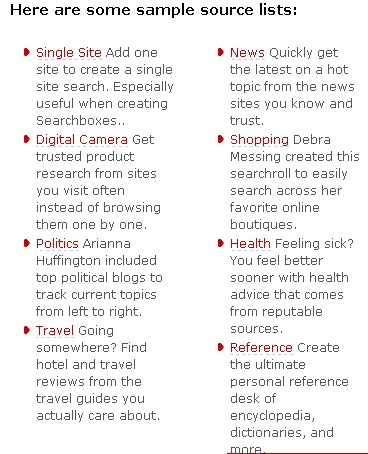 Technically, Searchroll is a personalized search engine that provides results from a hand selected collection of trusted sites on any given topic. For instance, a user can define a Searchroll called “Sports” which consists of searches on his few favourite sports sites. Once this “Sports” Searchroll is defined, users can use Rollyo to search all of the sites at once on the information he wants.